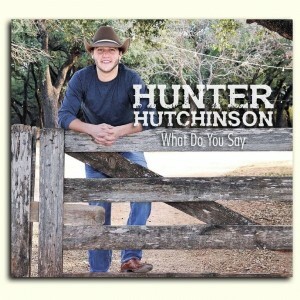 Hunter Hutchinson, from Abilene, Texas, released his debut album ‘What Do You Say’ in March. This is an introduction to an artist who has his roots firmly set in traditional country music, similar to the likes of Aaron Watson, who also grew up in Abilene and actually co-produced this album. Hunter has been lucky enough to share the stage with a number of established artists, including the Josh Abbott Band, Eli Young Band and also Aaron Watson. Aaron’s impact on this album is clear throughout, as Hunter combines a traditional country sound with catchy hooks and infectious beats, resulting in a very listenable collection of songs. A personal highlight on the album is the title track ‘What Do You Say’, which is about as ‘country’ as it gets. If you’re a fan of the more modern style of country, this will take some getting used to, but for lovers of a good old slide guitar and fiddle (like myself) this will be right up your street. I commented on the influence of Aaron Watson, and this track exemplifies this from start to finish. If you have heard ‘Freight Train’ on Aaron’s latest album, this is the track’s younger sibling, if you like! It’s a real stand-out on the album. This is followed by Hunter’s new single, ‘Storm To Weather’. Much of the album is not particularly mainstream-orientated and will struggle in terms of radio play, but this is the song which perhaps has the most potential. The contrast between this and the previous track is stark, and I believe it demonstrates a side to Hunter which a wider audience could really engage with. Having said that, it still features slide guitars and fiddles, which gives Hunter a clear identity as a true ‘country’ artist. Other songs to look out for include ‘The Man Who Believes In Me’, a track which demonstrates everything I love about country music. A wonderful, laid-back melody which wraps you up, along with very well-written, heart-felt lyrics about Hunter’s father. Also, be sure to listen to ‘Lonely Lubbock Lights’, a version of one of my Aaron Watson favourites which features Aaron himself! In summary, this is a solid start for Hunter Hutchinson, and it sets him up for a very successful career. Does it have mainstream potential? Probably not. Will country radio give it a chance? Probably not. But this was the case with Aaron Watson’s album ‘The Underdog’, and it didn’t stop that from reaching #1 in the Billboard Country Albums Chart. So, there’s definitely still an audience out there for traditional country. Hunter Hutchinson will certainly be a welcome addition to the Texas country scene.